A metal forming job shop in Mountainside, New Jersey takes pride in being a U.S. manufacturer that has smartly managed to reduce costs and lead times while maintaining high levels of quality for its customers. For American Aluminum Company (Amalco), a family owned company founded in 1910, the key is its well-honed ability to design, tool, and produce most parts entirely in-house. The vertically integrated company specializes in contract fabrication of custom and standard enclosures made by either deep drawing or hydroforming technologies, as well as aluminum dip brazing. Amalco also offers customers an extensive repertoire of secondary operations: CNC machining, piercing, blanking, forming, spot welding, and heli-arc welding, as well as wet and powder painting, anodizing, and light assembly. Amalco (amalco.com) employs more than 60 people at its 60,000-square-foot facility. By performing so many processes under one roof, the company says that it can produce products that many other companies would find impossible. 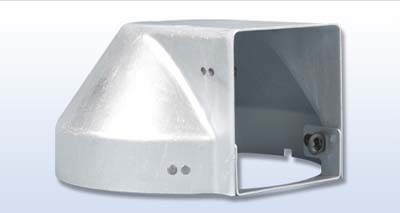 A hydroformed aluminum speaker housing created for the U.S. Navy. It is an 8-inch x 6-inch multi-piece spot welded military spec assembly that includes piercing and notching. Image courtesy of Amalco. "Being a job shop that has multiple operations and secondaries, we can do more under one roof than most other companies out there," said Amalco President Andrew Brucker, in a company video. "We can take a part from the raw stages and bring it to the finished product, including the CNC capabilities, the finished coatings that we can do, and the assembly work. And when you can do that, you can provide for your customers a quick turnaround time and a much higher level of quality because you're controlling it all in-house. And that's very important for us, and it's obviously important for our customers." Amalco's 107 years of experience in manufacturing custom designed parts have earned the company what Brucker calls "a tremendously loyal customer base." Other draw houses have referred customers to Amalco because they know that Amalco has the "experience, expertise, knowledge, and engineering and customer support to get the job done," Brucker wrote in an emailed response to a questionnaire. "Many times, we get inquiries for dip brazing," Brucker explained. "When customers realize we also have all the secondary services in-house to do the complete job, like machining, anodizing, and powder coating, their response is usually 'Wow! You can do all that!' They realize the cost savings that can be obtained by not having to send their part to various vendors where this necessitates new purchase orders to be written, additional incoming and outgoing quality inspections at all facilities, and increased shipping costs. In some instances, where the part could be deep drawn, customers have given Amalco the entire job– truly a big savings. "The other key factor is our customer service– making the customer feel that they are part of the process and can communicate with us any time," he wrote. "We are also the company that sees a part that many companies have no-quoted, and we take on the challenge." The need to protect electronics and other sensitive components from the elements is a critical requirement that doesn't figure to disappear any time soon. It's one requirement among many that Amalco is able to satisfy. The company manufactures a variety of round, rectangular, and complex shaped parts, including cans, boxes, and enclosures, for numerous markets. A representative sample of markets served by Amalco includes aerospace and defense; communications; industrial; medical and diagnostics; electronics; HVAC; marine; and automotive. This is a deep drawn medical tray formed for a medical manufacturer. After deep drawing the aluminum blank, Amalco spot welded feet to the tray. To finish the piece, Amalco bead blasted the part and anodized it. The tray is 8 inches x 8 inches x 2 inches. Image courtesy of Amalco. Despite its name, the company works with the full range of metals, not just aluminum. Its experience, according to Brucker, includes working with stainless steel, Hastelloy, Inconel, brass, copper, bronze, nickel, steel, and a variety of specialty materials. 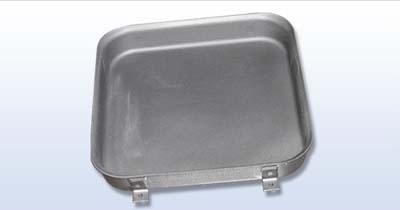 "We have made various sizes of deep drawn aluminum medical cases and lids that are used to sterilize orthopedic implant instruments; parabolic dishes for satellite communications, including voice, digital/internet and video transmissions, all for large personal watercraft; and deep drawn cylindrical enclosures with lids for housing of electronics/fiber optic lines, used for the transmission of the new 4G Network," Brucker wrote. Other parts made by Amalco are reported to include various sizes of industrial security camera housings, typically used in stadiums, arenas, shopping malls, and on highways; electronics enclosures with lids for missile systems; battery cases for the new JTRS (Joint Tactical Radio System) system; reagent aluminum and stainless liners for medical diagnostic equipment; and snare drum housings for the music industry. 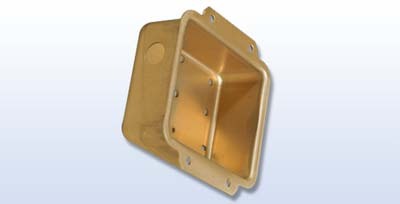 In addition to providing aluminum dip brazing of wave guide components and various aerospace/electronics enclosures, the company has produced copper oxygen containers with lids for use by commercial airlines; and Hastelloy C276 pump housings for highly corrosive water applications in both industrial and nuclear markets. The American Aluminum Company was founded by Henry Brucker in 1910, after the company he worked for moved to the Midwest. This deep drawn, spun aluminum snare drum was pierced and finished with a powder coating. It measures 24 inches in diameter and 10 inches tall. Image courtesy of Amalco. "Henry's infatuation with aluminum started when he was attracted to an article written in Scientific American on a new discovery of light metal aluminum and its possible uses," the company said on its website. Later, an ad attracted him regarding a 3-inch scale made of aluminum and as light as a feather. That was the beginning of his career in aluminum." Henry Brucker's fascination with aluminum continued as he worked for metal fabricating companies doing brazing, operating foot and power presses, and other secondary operations associated with metal forming, the company said. "At age 22, he was experienced in a number of types of manufacturing processes, including aluminum. He was a good problem solver and liked to read all current articles on production. His early experience in working with aluminum and his supervisory abilities led him to the New Jersey Aluminum Company, where he spent the next 14 years of his life during a period of the rapid expansion in the uses for aluminum." In 1910, the New Jersey Aluminum Co. was bought and moved to the Midwest. "This provided the impetus for Henry Brucker to go ahead with his plans for a business of his own. In October 1910, he rented a few hundred square feet in a loft building in Newark, New Jersey, and purchased a spinning lathe. He was in business," Amalco said on its website. "Those special skills, talents, knowledge, and enthusiasm for the metal forming business have been passed down through four generations of the Brucker family," the company continued. "Starting first with aluminum cups and novelty items in 1910, over the course of the years, our products have covered a wide range of consumer, industrial and defense-related products." Amalco's main processes date to the company's beginning. Today, the company explains the basics of its processes through the teachings of a fictional character, "Professor Metal," on its website. Deep drawing, one of the company's core processes, begins with choosing the right alloy with the help of an engineer, who can help select the best metal for a customer's specific application. The chosen metal is then cut down to 48-inch diameter blanks that are treated, according to their properties, to avoid tears and cracks and preserve the integrity of the alloy, the company said. Then the part is formed by drawing the metal blank around a punch as the blank is pulled through a die. This step, drawing the metal through a die, can be performed numerous times to decrease the diameter and increase the length of the part, according to the company. 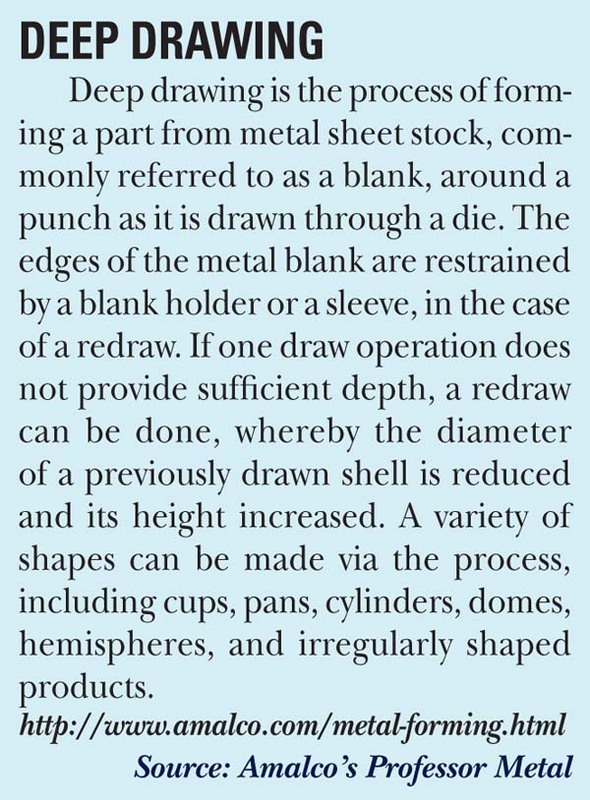 Typical parts made through the deep drawn process include cups, cylinders, domes, boxes, hemispheres, and cans. If the first draw doesn't create a part with enough depth, the piece can go through numerous draws and several dies to achieve desired depths of up to 24 inches, the company explained. "We take sheets of any type of metal– stainless, carbon steel, Hastelloy, Inconel, and others– and out of those sheets we do multiple draws, as we call it," where we reduce the size of the blank, smaller and smaller, deeper and deeper, to form really custom shapes," said Amalco's Al Chillemi, explaining the company's deep draw process in a video interview at a D2P tradeshow. "Those enclosures are used for electronics, and security camera housings, for any piece of equipment that needs seamless construction. That's our specialty, really– custom parts that no one else can draw. A lot of engineers will design a part, but it's not a good way to manufacture it. We will help them design it so we can manufacture it as cheaply as possible, yet maintain the quality. And also, we have in-house capabilities to do most any secondary operation. So once we draw a part, we can put holes in, we could paint it, iridite, anodize, and we have CNC machining centers. So we're really a one-stop shop." Amalco also offers hydroforming, a manufacturing process that uses hydraulic pressure to shape flat metal sheets into parts. In this process, fluid pressure is applied to a ductile metal blank to form the desired part. The process requires hydroforming tools, consisting of a punch made in the shape of the desired part, a ring contoured to fit around the punch, and a pressurized forming chamber sealed by a flexible diaphragm, according to the company. As with deep drawing, the process begins with choosing the right metal for the part, the company said. Once the right metal is chosen, Amalco cuts the metal into 21-inch blanks and prepares them for the hydroforming process. The next step, according to Amalco's Professor Metal, is to form a punch in the shape of the desired part. The sheet metal blank is put inside a machine, which raises hydraulic pressure on top of the sheet. At the same time, the punch is pushed against the blank from the underside to form the part. The hydraulic pressure and the force of the punch combine to shape the part. The resulting hydroformed part is said to be seamless, and no x-ray testing is required. Amalco lists the advantages of hydroforming as it being less costly than deep draw processing, and it is a process that turns a single piece of metal into a part without welding, which means the part is seamless, not requiring pressure testing or x-rays. A third process that Amalco started using in 1982 is aluminum dip brazing, a technique for joining two pieces of metal. The process is reported to join two pieces of metal with a third metal, a filler metal, between the two pieces to be joined. The parts are heated to the point where the joining metal reaches its melting point. 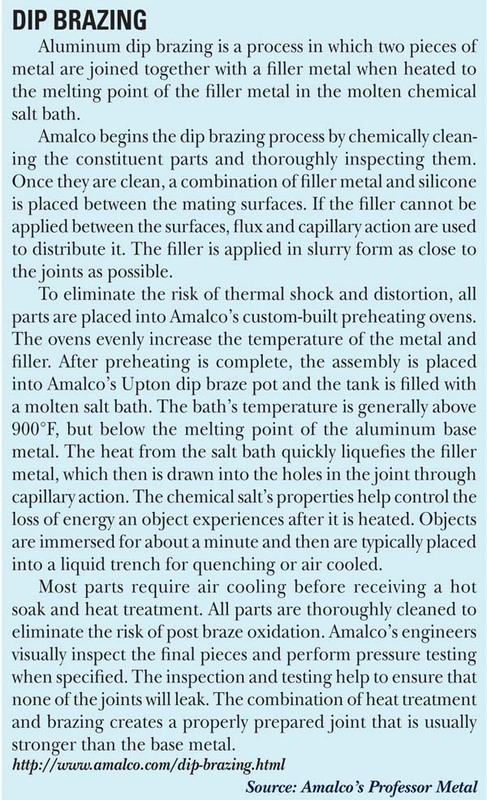 Amalco had been dip brazing its own assemblies for more than 30 years as part of its secondary process capabilities, according to Brucker. "We realized this service was lacking in the industry for a number of reasons, so to this end, Amalco decided to offer this specialized service to the general marketplace as a "stand-alone" business, as well as still doing our own parts," Brucker wrote. "Given this experience, Amalco has dip-brazed simple and complex assemblies for the most demanding customers in such markets as medical, defense, communications, automotive, aerospace and general industrial, as well as a host of many other industries. We realized that dip brazing could be combined with many other of our 'in-house' primary and secondary operations in order to save our customers time and money. This made perfect sense since our dip braze tank runs 24 hours per day 7 days a week." 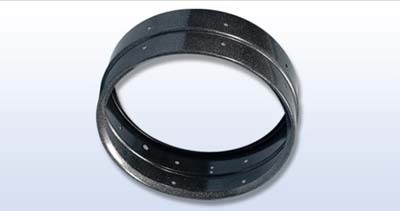 This is a hydroformed aluminum gyro housing made by Amalco for use in industrial communications. It has been pierced and includes an iriditefinishing. The dimensions are 5 inches x 4 inches x 3 inches. Image courtesy of Amalco. Amalco's fired-brick Upton furnace uses graphite electrodes to heat a molten chemical salt bath to approximately 1,100 degrees Fahrenheit. The temperature can be controlled to within 4 degrees Fahrenheit to 5 degrees Fahrenheit, Amalco said on its website. Amalco had long had an automated wet paint conveyor system, but when the company realized that more and more customers wanted powder coating, Amalco introduced that service about eight years ago. "Being able to now powder coat rather than sending parts out to a painting vendor, we now can provide customers with another cost savings," Brucker wrote. The company is also looking at 3D printing to aid in prototyping and production, he added. More than five years ago, Amalco made a decision to become a solar powered facility and installed solar panels on the roof of its facility, a move that reflected its commitment to operating as an environmentally friendly company. But from a business perspective, Amalco's decision to go solar did more than reduce the company's energy footprint. By efficiently reducing its own power costs and overhead, the company is able to provide its customers with additional cost savings, thus staying more competitive. In an emailed response, Brucker called it "a true achievement, being a New Jersey based manufacturing company with some of the toughest EPA restrictions in the nation." "Going green for us was important," said Brucker in the company's video. "It was not only about reducing our footprint on this earth, and as we all try to do that, it was also about staying competitive in the marketplace. We will generate a little over 50 percent of our power using solar technology, which will allow us to reduce our costs, and reduce our overhead, to be more competitive in the market."